Food waste is a substantial opportunity for the German hospitality sector, but to date most of the attention has been on post-consumer waste. Smart operators are now starting to see significant savings in the prevention of food waste before it gets to the customer’s plate. A focus on this would help the country halve its avoidable food waste, an achievement which could save the sector up to €800 million while doing the right thing for the environment. The German hospitality sector is booming. A recent study found that four of the ten cities in Europe with the most active hotel project pipelines are in Germany. The contract catering space also continues to see solid growth, with the top eight players generating more than €2.4bn of revenue between them in 2016. In the fine dining space, Germany was awarded its highest ever number of stars in the 2018 Michelin guide. As the hospitality sector grows, so does the issue of food waste. The scale of the problem is staggering. "At the moment, it's as if we were to convert the states of Mecklenburg-Western Pomerania and Saarland into a huge field and simply discarded the harvest," says Christoph Heinrich of WWF Germany. It is estimated that 18 million tonnes of food are wasted every year in Germany. Around 60% of this is from households, while 20% comes from grocery stores. Larger food consumers like restaurants and cafeterias generate 17% of the country’s food waste. The policy response to food waste has so far focused almost entirely on the household consumer. This is not surprising given that each person in Germany wastes more than 82 kg of food every year, although it is ignoring a substantial opportunity to materially reduce waste while delivering an economic benefit. In 2002 the German Federal Ministry of Food and Agriculture launched Zu gut für die Tonne! as an app to provide recipes that use leftover food. Today the mobile and tablet app has more than 450 recipes from famous chefs, and it also serves as a broad information and education platform on the topic of food waste and how to reduce it. This includes tips on buying, storing and the perishability of food, and the team organises action days and provides listings for initiatives and events. Part of the government’s response to food waste has also been to encourage entrepreneurs to innovate and create new solutions. Zu gut für die Tonne! awards an annual prize to individuals, businesses, NGOs, researchers, initiatives or campaigns seeking to take action against food waste. Another great example is The Good Food, a supermarket in Cologne that just sells salvaged food waste. The store, which opened in 2017, is the first of its kind in the country and only the third in the EU. It sells products of all kinds, from vegetables to beer, that would otherwise have been thrown away. Innovation is everywhere. In an effort to limit food waste, for example, sushi restaurant Yuoki in Stuttgart has added a fee to its bill for customers who don’t finish what’s on their plates. The restaurant's Taste 120 option has always allowed diners to consume as much sushi as they want in two hours. Now, according to the founder Guoyu Luan, a fine of €1 is applied for any remaining sushi as a result of its “eat up or pay up” policy. In 2016 the government announced its target of halving food waste by 2030. “Food belongs in your mouth and stomach, not in the garbage bin,” says former Agriculture Minister Christian Schmidt. While the programmes listed above all contribute to meeting this target, however, there is a much larger opportunity facing the hospitality sector within its kitchens. 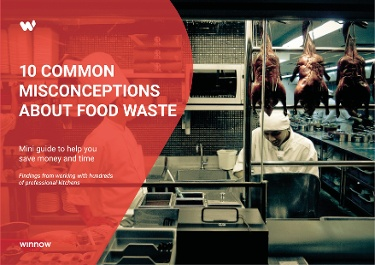 According to research by the University of Stuttgart, Germany’s food service sector (including contract caterers, restaurant, hotels and take-aways) wastes 1.9 million tonnes of food annually. The study further states that 48.5% of this sector’s food waste is avoidable. This represents a potential saving of €1.75 billion in monetary terms. While this number is intimidating, appearing to be an insurmountable problem, we prefer to look at avoidable food waste as an opportunity yet to be realised. Working with thousands of chefs from all over the world, we have consistently shown that food waste can be cut in half when we equip kitchen teams with digital tools. By reducing overproduction in hotels, staff restaurants, schools and universities, food purchasing costs can be cut by 3-8%. Based on Winnow’s data and market analysis, German hospitality and food service businesses that prepare food in advance could together save themselves as much as €800 million per year. In addition to the great work being done in Germany around household consumers, we would encourage the hospitality and food service sector in Germany to seriously consider the opportunity presented by pre-consumer food waste. The financial rewards for businesses reducing their food waste are huge, but just as importantly it is the right thing to do for our planet.